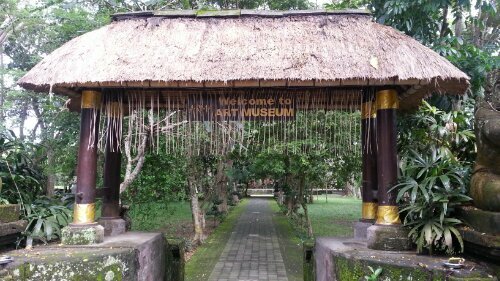 As I passed through the leafy welcome arch of the Agung Rai Museum of Art (ARMA), I wished I had come earlier. 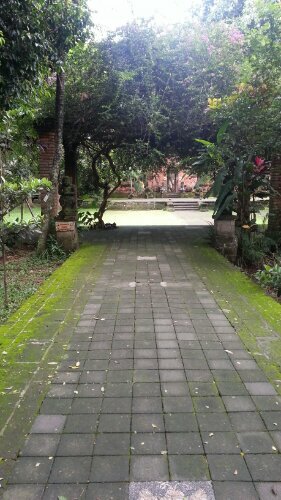 It was about four in the afternoon and seeing how shady the gardens were, I knew it was a place that invited one to linger. Get lost in the pages of a nook perhaps. Or just luxuriate in the shady ambience of the moment. 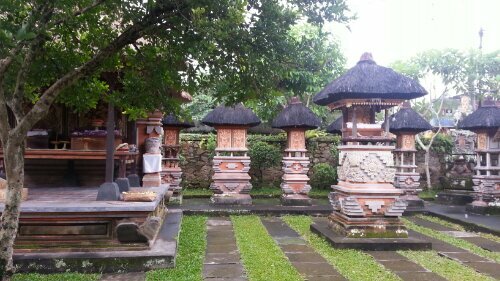 The grounds contain a temple as well as an upscale resort. Three men were working on some woodcarvings in one of the small pavilions and I had a nice chat with them. Good way to practice my Bahasa. 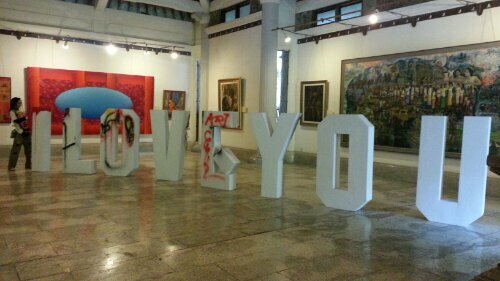 There are two galleries that contain the personal collection of Agung Rai. 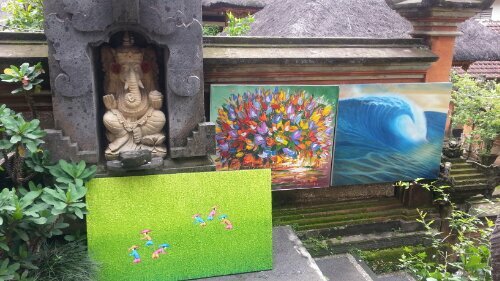 An art collector with humble origins starting out selling paintings to tourists in Sanur, Rai’s collection is a virtual walk through of the history of Balinese paintings. It was a collection of a man who knew what he wanted. 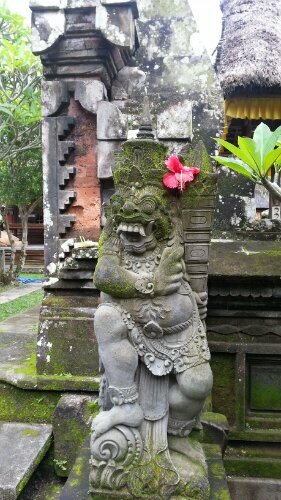 From old wayang style paintings to modern ones, it was a peek into Balinese imaginings. 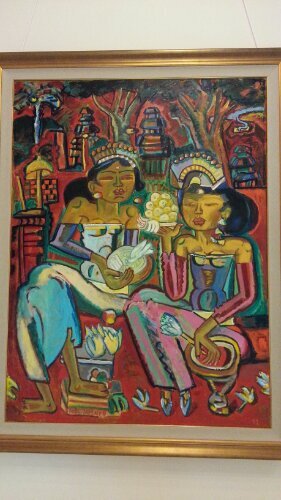 I had seen the works of the different art styles in the Puri Lukisan such as those by I Gusti Nyoman Lempad, Bali’s greatest visual artist. But I had not seen that of the German, Walter Spies. After going through the short exhibit on Spies the more I was intrigued. His works blew me away. I especially like how he delineated his figures. His paintings had a magical quality in them that evoked a quiet and sensual mood in them. Paul Husner’s paintings were also on exhibit. They were playful and colorful depictions of Balinese everyday life, ceremonies, and rituals. The museum also housed antique textiles some of which are very valuable such as a gerinsing textile from Tengganan. Gazing at the textile from afar, you can make out the human figures woven into the design. The ARMA, together with the Blanco Museum, make museum going so much a sensory experience as it is visual. 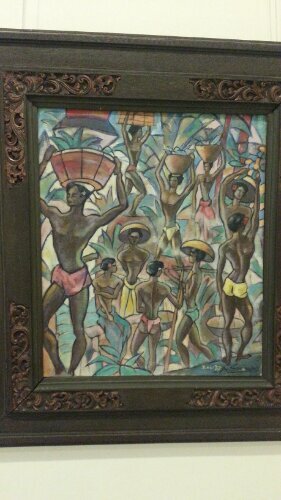 Where Blanco’s passion was the shapely figures of Balinese women, Rai’s was that of art as a whole. ARMA is a testimony to that passion. 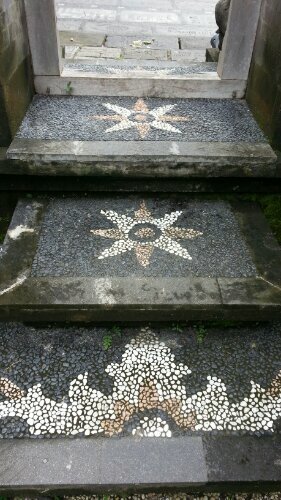 For more than two weeks in Ubud, I walked the same paths each time I go to my gamelan lessons at Pondok Bamboo. It’s more than a kilometer of walking but it never bores me. 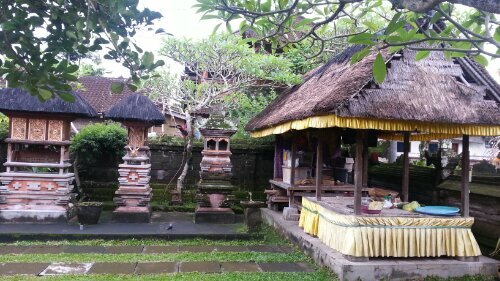 There are quiet old moss-covered temples. 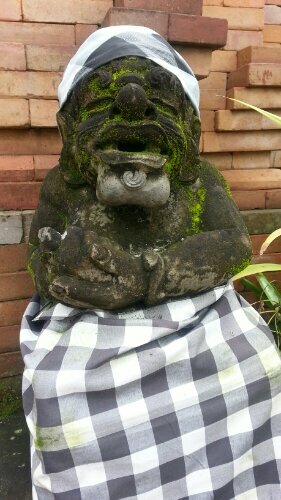 Cute sculptures that greet you at the entrance of family compounds. 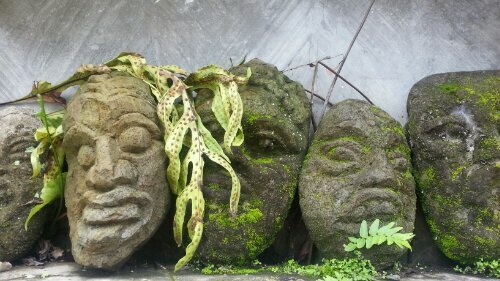 Interesting stuff for sale such as these stone sculptures. 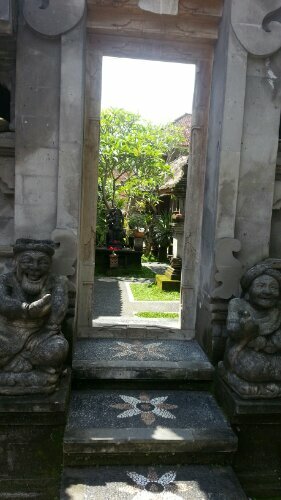 Beautifully carved doorways that lead to equally beautiful houses. 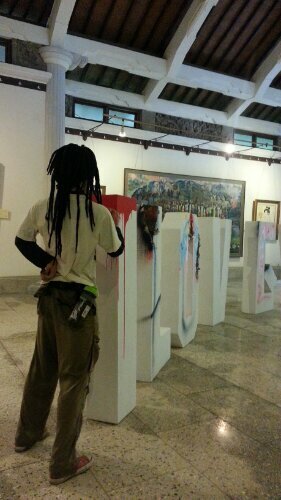 In a monograph on Balinese painting, I read that the closest word there is to “art” is “life.” Why not? 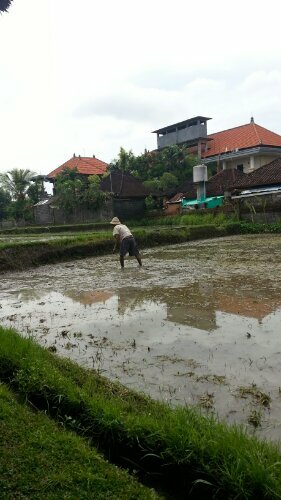 The Balinese, especially those in Ubud, live it and breathe it every single day of their lives. They just don’t call it “art.” It’s just is. It comes as no surprise that everything is just so beautifully decorated. 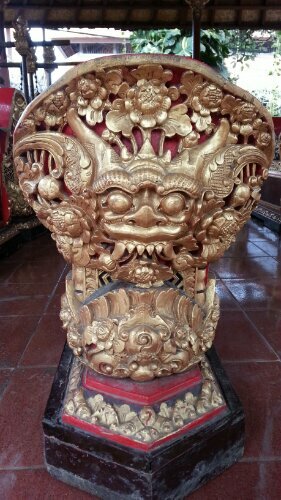 Gamelan frames have relief sculptures. 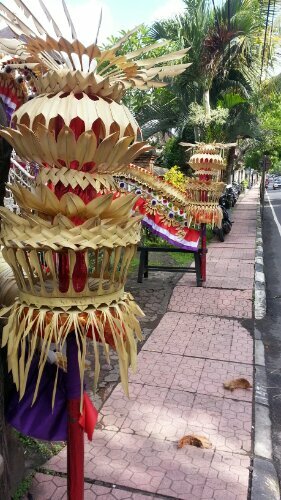 Walking down the street, you see beautiful woven decorations such as these. 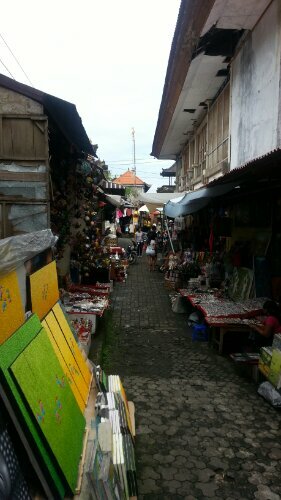 Tucked behind the Ubud Market is a narrow lane made bright by the colorful paintings on display. The entrance to the compound is like an art gallery. Even the entrance guardians have p a in paintings. 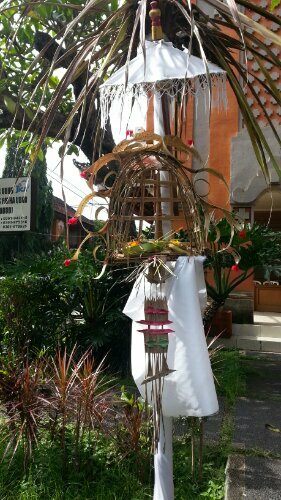 The Balinese love their gods and they express this through colorful offerings. 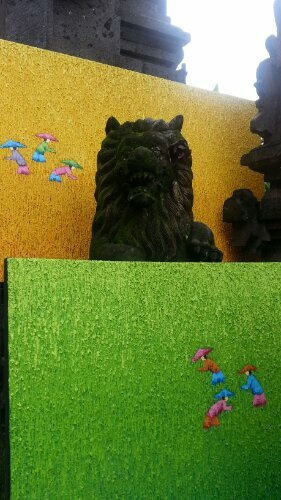 Shrines are as gaily decorated as legong dancers. 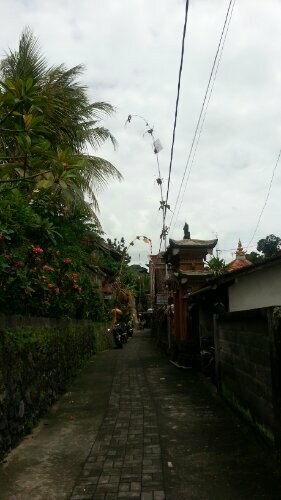 I never got bored walking around Ubud as the streets are one big canvass. 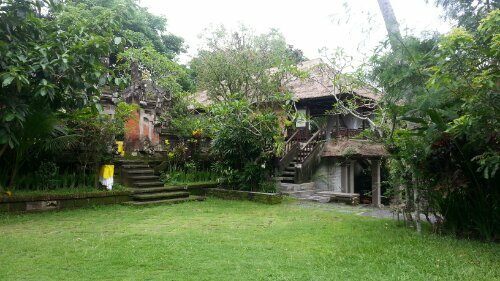 During my course of stay in Ubud, I lived in two homestays— Taman Mesari at Jl Sandat and Rojas Homestay at Jl Kajeng. 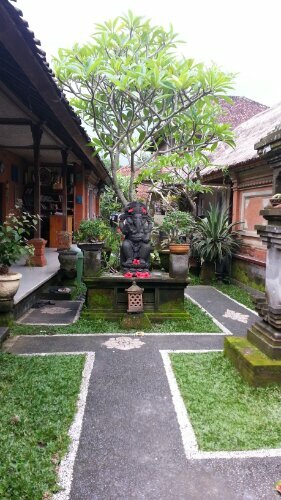 There are heaps of guest houses, villas, and hotels but living in a homestay is a unique experience. 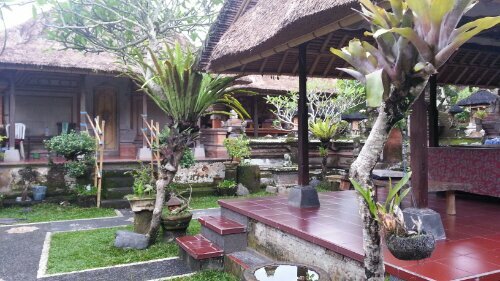 For one, you are staying in a real family compound with a real Balinese family. 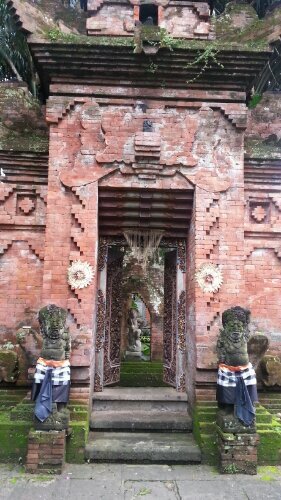 I found Taman Mesari at AirBnb while I found Rojas by simply going to Jl Kajeng when I cancelled my trip to Lombok and extended my stay in Ubud. Rojas was the first place at Kajeng and it was cheap. I know, I should have checked others out but I was too lazy then. 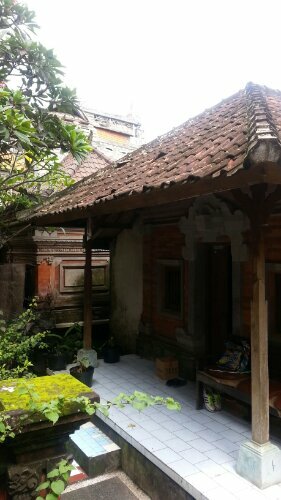 The Balinese don’t live in stand-alone houses. They stay in large compounds with several bungalows with their extended families. Entering one is getting a quick introduction to their spirituality. Like the rest of their lives, orientation of the different structures are governed by their Hindu beliefs. 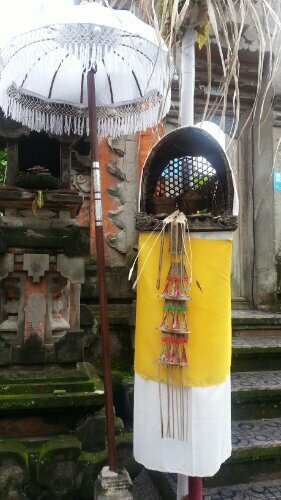 Outside the entrance is a small shrine where offerings are placed. 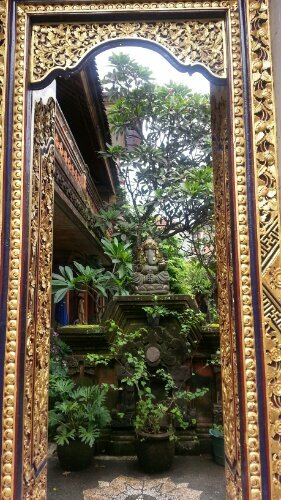 Main entrances are always narrow but are beautifully adorned with carved lintels and doors. 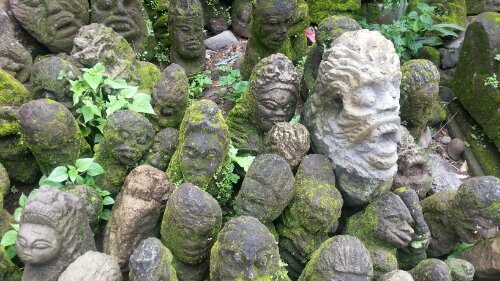 These statues of stones welcome you as you enter. Because of the belief that malevolent spirits travel in a straight line, there is always a wall to block their entrance. Nope, spirits can’t climb walls. 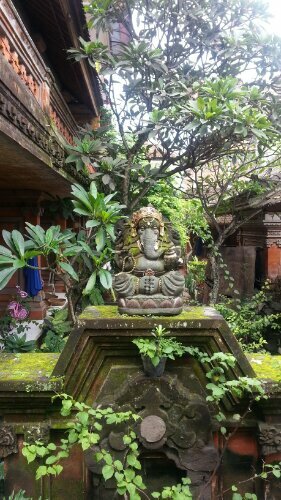 A statue of Ganesh for added protection. 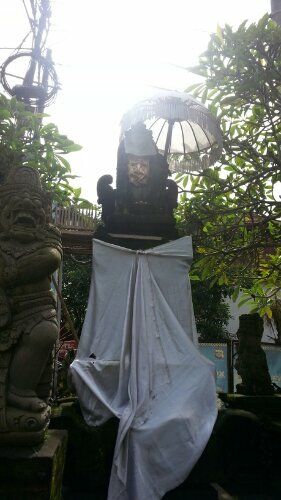 Another shrine is also by the entrance to ward-off evil. The placement of all structures in the compound are of utmost importance as there are cosmic implications. North (utara) and east (timu) are the orientations of choice. 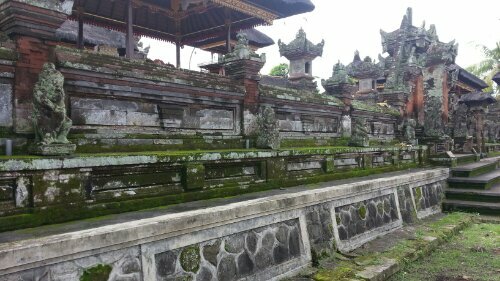 The temple have to be aleays north so it faces Pura Besakih, the mother temple. 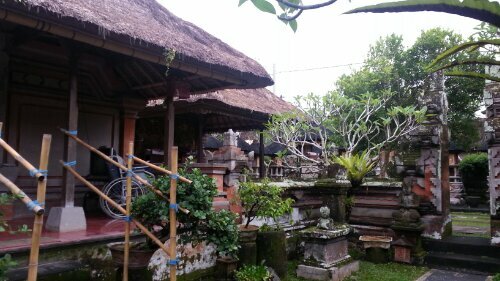 In fact, temples all over Bali are oriented towards Besakih. The different bungalows which are the sleeping quarters of the family members are oriented as follows: the parents are in the north while the rest are in the west and east. The structure on the left is where the Pak or the old man lives. To the right is the family temple. All compounds must have a family temple. 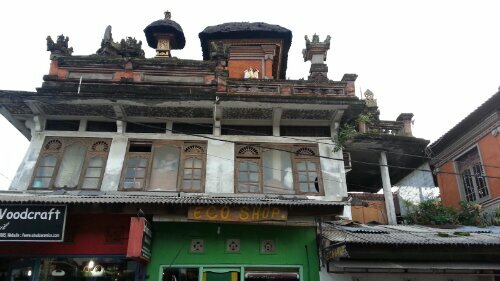 If a house is small, the temple could be up on the roof. Once the eldest son gets married, he moves to the back of the compound and builds his own bungalow. The younger one gets his own bungalow. The kitchen is considered a dirty place so it’s in the south. You will also see a pavilion with a bed. 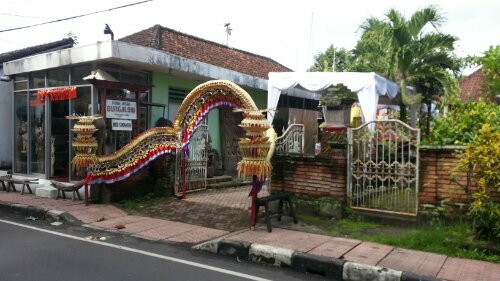 This is the bale danginwhere ceremonies are held. It’s cool having your own bungalow. 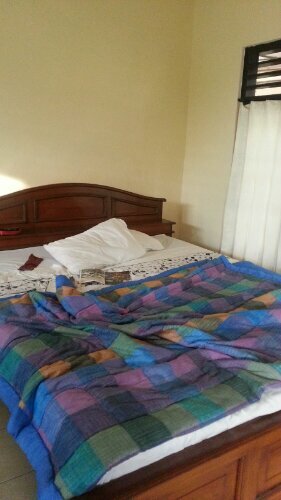 At Rojas, I’m in a two-level purpose built structure with 2 rooms per level and a veranda. 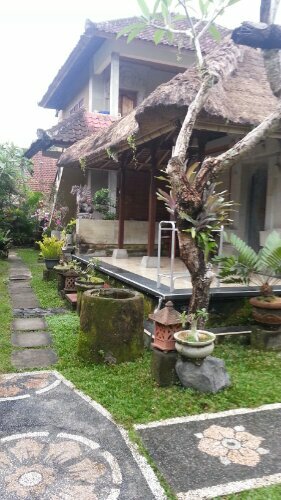 At Taman Mesari, I had my own bungalow, which is usually the case in most homestays. 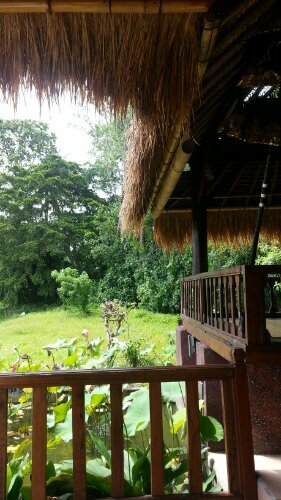 I really relished staying in one of those because it was like having your own little cottage with lots of privacy plus a cute veranda perfect for coffee or simply passing away the time. 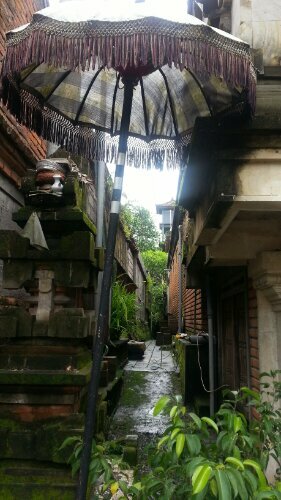 Balinese family compounds are really interesting places and sometimes I would peer into one to just look at the little gardens and courtyards and admire the architecture. They’re also very leafy with lots of plants and flowers. Even the tiles are decorated. You can simply enter any compound that has been turned into a compound. They will gladly entertain you. You are, after all, a potential guest. A family member, usually the Ibu (mother) will show you around. “If you want to take pictures of my house, it’s okay,” one pleasant lady told me. 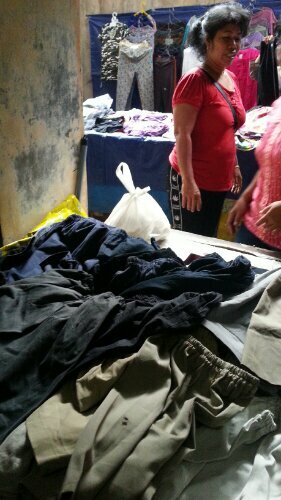 They’re usually located in small quiet streets away from the traffic and crowds of the main commercial roads. Often these small streets and even lanes are purely residential. 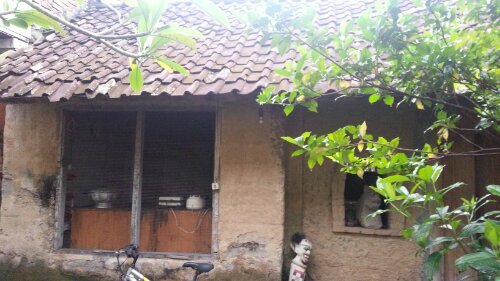 At the end of Jl Sandat where Taman Mesari is, I would sometimes here the neighbor practicing on the tingklik (a bamboo xylophone). 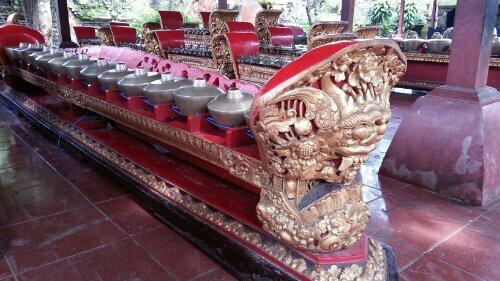 Many nights I would sleep to the sound of a gamelan echoing probably from some nearby temple or family compound celebrating something. This one is just off the art market and the entrance is an extension of the shop. Aside from the all-over feel of the place, staying at a family compound lets you interact with the locals. 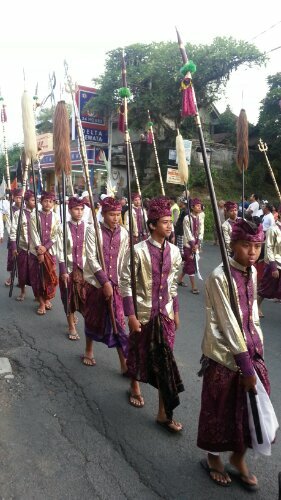 At Taman Mesari, the owner’s cute kids would sometimes get their procession banners and march around the compound pretending they were in a ceremony. 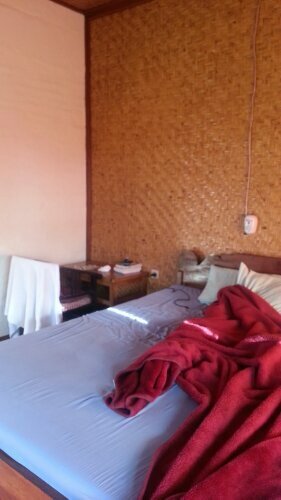 I like to be as close to local life as possible as homestays let me do that while still allowing me my small comforts such as a Western-style toilet and free wifi. Plus of course, ranging from IDR 150,000 to 250,000 it’s really budget friendly. 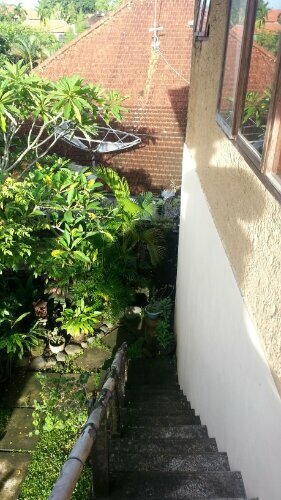 Some like Rojas even include free pancake and fruits breakfast plus all day tea and coffee at your veranda. Can’t get any better than that. 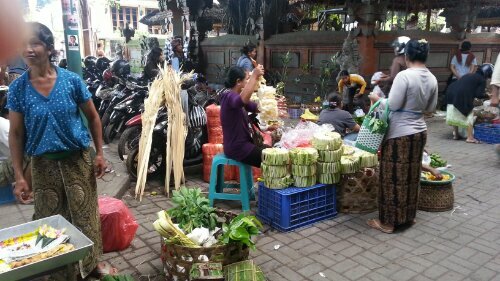 Early in the morning, Ubud’s pasar seni plays its traditional and time-honored role in the everyday lives of the Balinese. 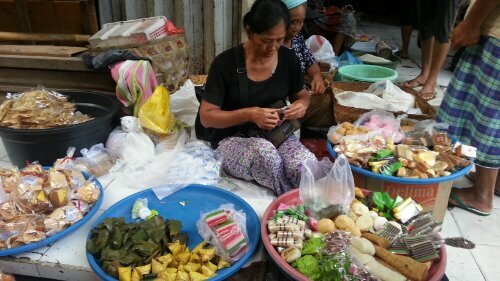 As a traditional market, it’s locals purchase all their usual needs, especially food. Long before Western-style groceries and department stores set-up shop in developing countries, morning markets have sustained, and still sustain, village life. For visitors like me, it provides a colorful and lively glimpse on sundry local life and the chance to get some cheap delicious grub. Where else can you get hot-off-the-grill sate for a measly IDR 1,000 (Php 4.00)? During my cooking class, we were toured there by our chef who pointed out all the different fruits, vegetables, and spices used in Indonesian cuisine. 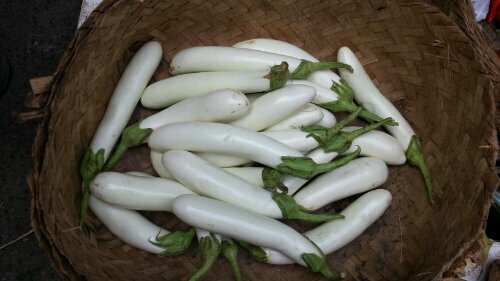 My favorite vegetable is this basket of smooth white eggplants. I’ve never seen such eggplants before. All the other vegetables suddenly seemed so ordinary. 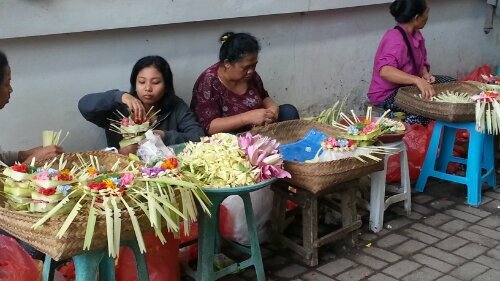 At the front of the inner courtyard are women selling all sorts of ready-to-offer canang for the busy Balinese. Or if you have loads of time or really want to make your offering truly personal, all that you would ever need is there. Palm leaves to make the frame with. 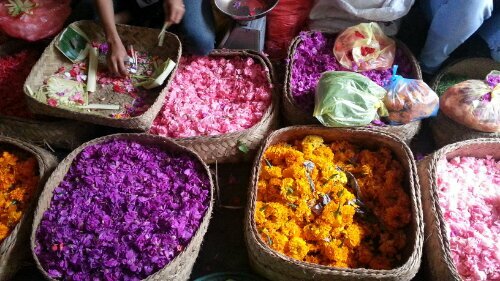 Flowers to fill your little basket to the gods. Of course, what’s a market without food? 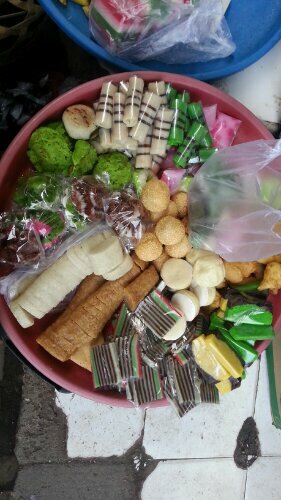 There are a variety of little snacks such as colorful kue selling for IDR 1,000. Downstairs, at the peripherals are a few stalls selling freshly-cooked food such as roasted chicken, smoked duck, steamed rice, grilled sausages, sate, and other viands. A few tables are set-up for makan sini (literally to eat here) but most go for bungkus (literally to wrap). 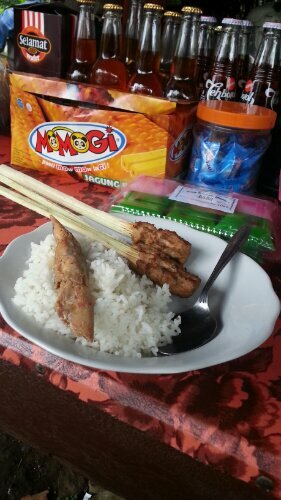 I bought a serving of rice and sausage for IDR 15,000 (Php 60) which I think was harga wusata (tourist price). The sausage was meaty and flavorful. I wish it was spicier, though, like the northern Thai Isaan sausages. This duck stall had a queue of patiently waiting locals. 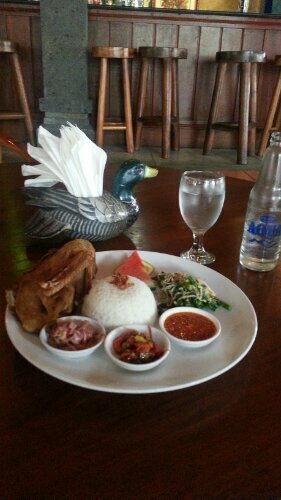 The bebek (duck) must be enak (delicious). 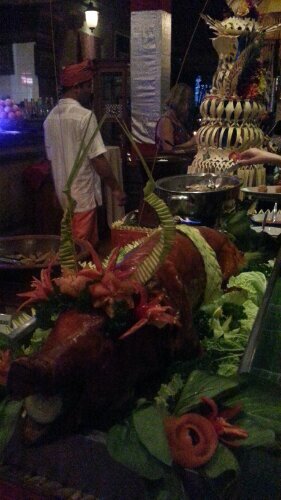 And because Bali is Hindu, babi (pork) is everywhere! 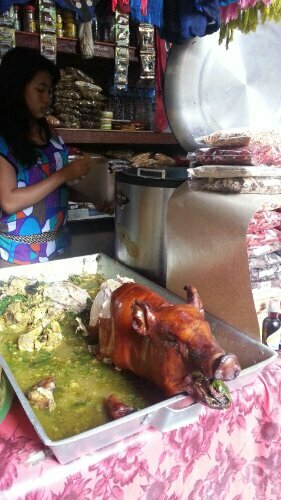 And the pride of all Balinese babi, the delicious (drum roll) babi guling! 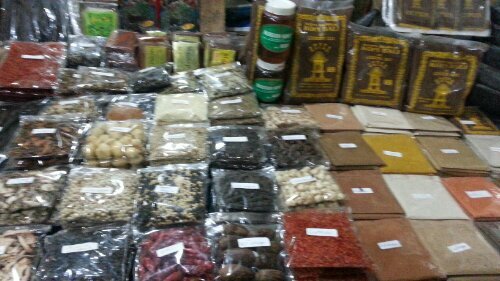 My aim really was to buy some spices to bring back home so I can cook those wonderful makanan I learned at cooking class. I bought three kinds of ginger (dried of course)— galangal, lezaro galangal, and a really aromatic one, zengleo. 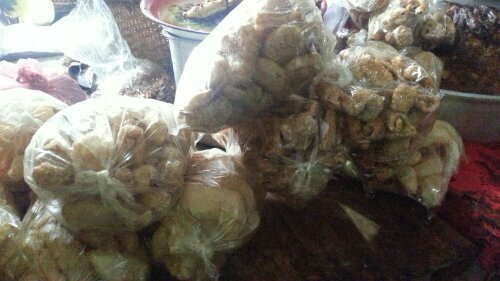 These were going for IDR 20,000 per pack but bargained it down to IDR 13,000 because I bought a lot. 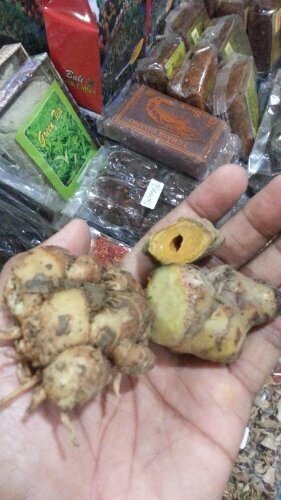 A small pack of saffron was at IDR 20,000 but got it at IDR 15,000. I probably paid harga wisata but it was still quite cheap considering those types of ginger aren’t available back home. There were lots of other things such as cinnamon, cardamom, vanilla, turmeric, black pepper, white pepper, nutmeg, and many more. Candle nuts (macadamia to you and me) were cheap. Still gotta check though if customs will allow it. 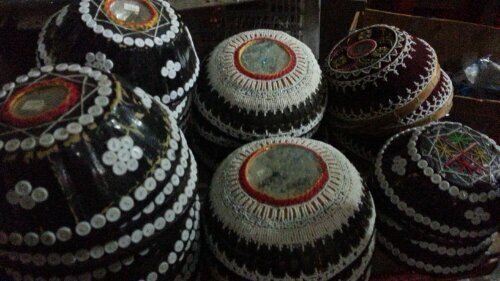 Another item I wish I could bring home was tempe, that ubiquitous fermented soya beans formed into cakes. Very very good fried or cooked in curry. Once you’ve cooked your food, you gotta offer some to the gods. Be sure you cover them nicely. It’s not all food. How about some second-hand clothes? 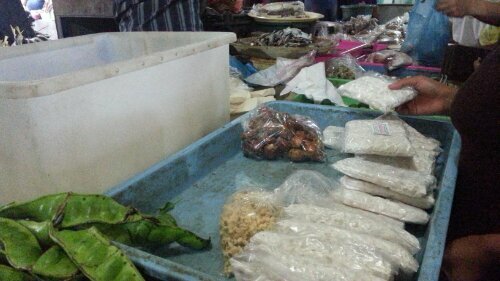 The traditional market is nice to browse around especially if you have a keen interest in cooking. It’s busy around 7 when most locals shop. Refrigeration is a luxury to most of the people so they market almost evetyday. That means you get fresh from the market ingredients in your meals. Everyrhing winds down past 8 as the vendors pack-up and the tourist stalls open. 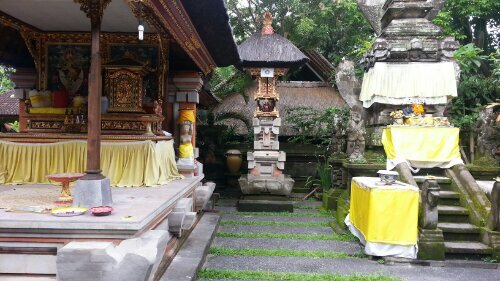 Ubud Enak: Makan! Makan! Makan! 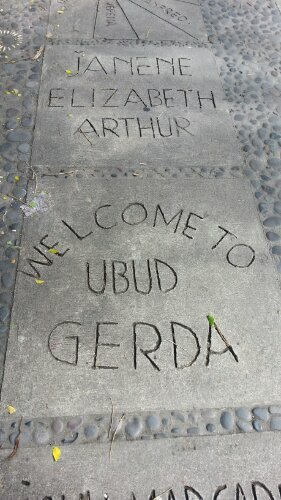 Beyond art, Ubud is food paradise especially if you’re like me who loves his nasi goren, sate, and curried. 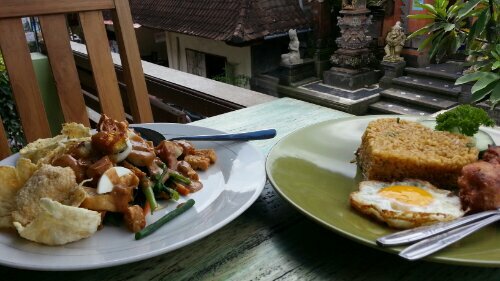 Just like the Balinese concept of good existing alongside bad, there is a fair share of good warung and bad eating places and food in Ubud. Of course, you can’t really judge an entire place based on one order so my biases are based on what I simply ate. 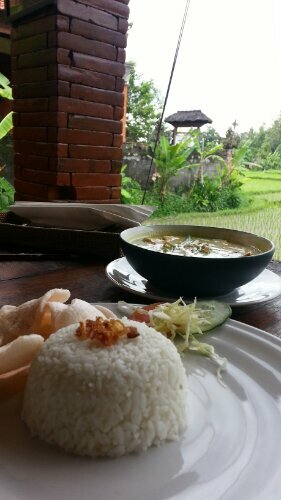 Also, whenever I travel, I almost always stick to local food so you won’t findy non-Indonesian eats here. Really delicious food doesn’t need to come in fancy packages. The best meal you can sometimes have is served in a little shack by the road. My first taste of pepes and sate lilit ikan was at a little stall by the road on my way to Julah up in the north. It was way past lunch and I was really hungry. Both the pepes and the sate had just been grilled. 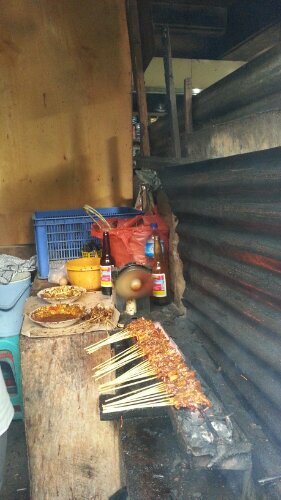 I liked the sate most especially, I ate 5 sticks with a plate if nasi putih all for just IDR 7,000! As local as local could get. My driver also took me to a warung in Singaraja to try siobak, a soecialty of the north. It was a thick gooey stew of pig ears, organs, and fatty cubes. It tasted sweet with a hint of spices. I didn’t like it very much. It only cost IDR 5,000. 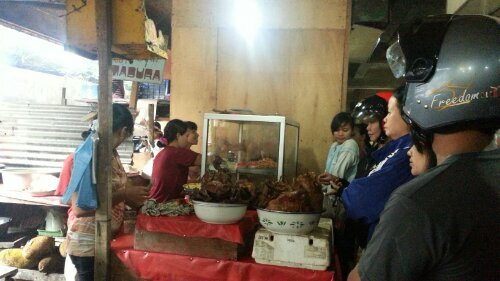 While waiting for our orders, I had some sati babi which was grilling just outside the warung. Really delicious. Probably one of the cheapest eats around and we gotta thank the Minangkabau of Sumatra for the concept and the recipes. 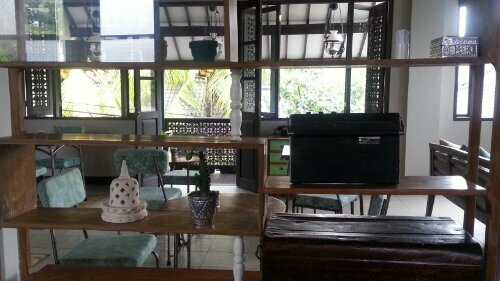 These simple eateries are all over Indonesia and there are two in Ubud. 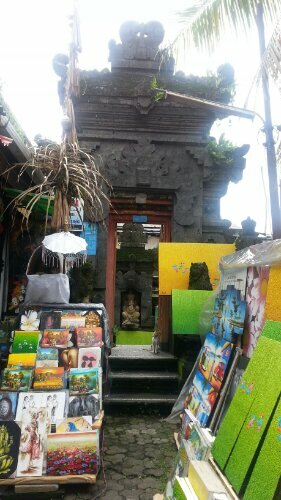 One in Jl Hanoman and the other in Jl Raya Ubud a stone’s throw away from Ganesha book shop. 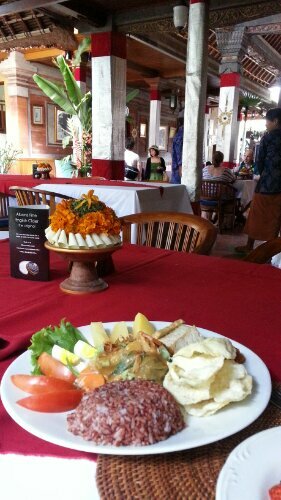 For about IDR 20,000 you get a plateful of rice, vegetables, and two viands of your choice. You can choose as much viands as you like and just pay accordingly. Yeah, the food is pre-cooked and has been sitting at the counter for some time but fear not as the kind of dishes displayed and their cooking techniques aren’t the type that spoil easily. Lots of locals eat here too. Try the chicken dishes which have been marinated in spices. 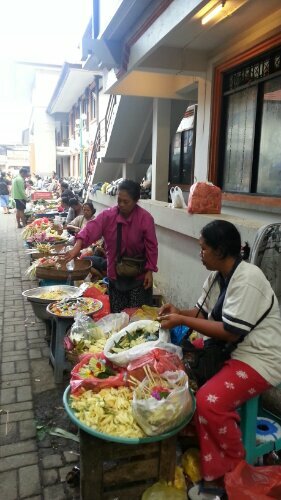 In central Ubud, a warung doesn’t automatically translate to cheap pit stops where the locals eat. It’s simply a place, any place, for tourists to eat. Real warungs do exist but you certainly wouldn’t find them along the main tourist areas. 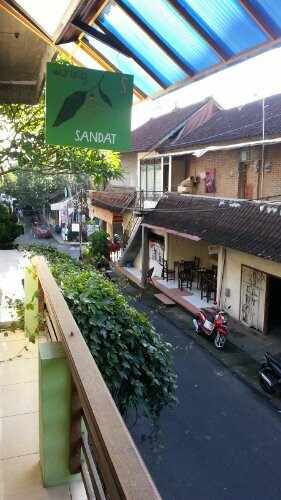 Near the corner of Jl Raya Ubud and Jl Sandat where I’m staying at is an all green warung imaginatively named Warung Sandat. 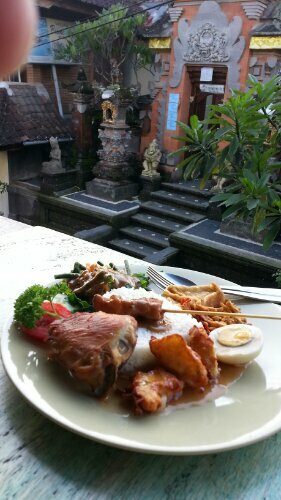 Took a seat at the second level overlooking the street below and enjoyed my nasi campur. On another occassion, I had a gado-gado and a nasi goreng. 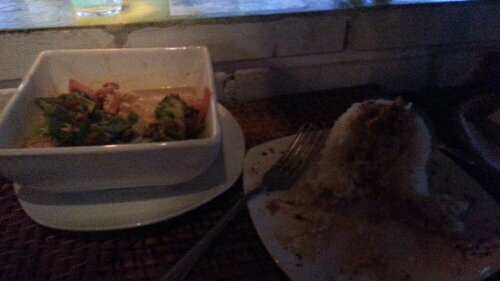 The food is very good value for money, tastes homey and very filling. If you like your food good and simple, then this warung is for you. Thank Brahma, Vishnu, and Siwa for restaurants that live up to their names. 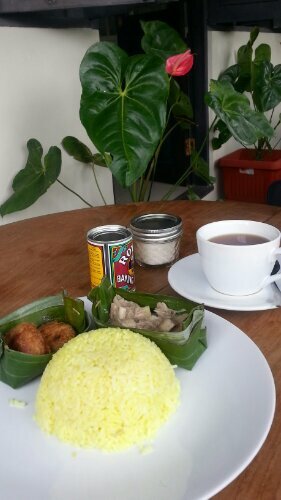 After a barong performance at nearby Agung Rai Museum (which, by the way, has a splendid collection housed in two galleries) I headed to Warung Enak, took a seat outside and ordered a nasi campur. It was simply enak. Everything from the freshly fried kropokto the urab sayur to the nasi and everything in between was simply flavorful. The curries were simply the best I’ve had. I was tempted to ask for a full order. 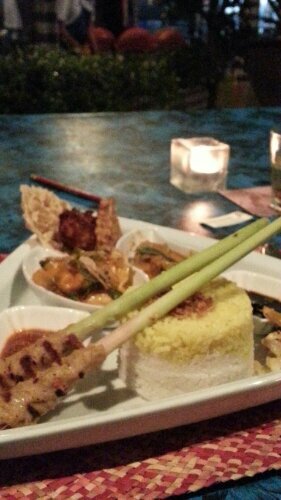 The rice was interestingly presented as the bottom layer was nadi putih and the top nasi kuning. Maybe next time I should have riijastafel all to myself. By the way, service was gracious and excellent. It’s a bit on the expensive side as the mains were around IDR 40,000 up. Worth it though. The welcome drink, a concocotion of tamarind and lime juice was simply divine. 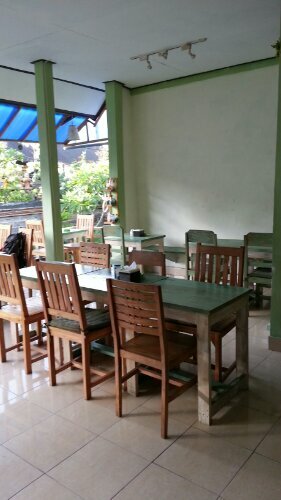 Warung Lokal at Jl Gootama serves more than local food. There are pancakes and pasta. It’s a small place with only a few long communal tables and devoid of any decoration. The nasi goreng was very good though it could do a little less kecap manis. The krupuk however, was as stale as the server who didn’t want to be bothered from sorting a bunch of string beans. 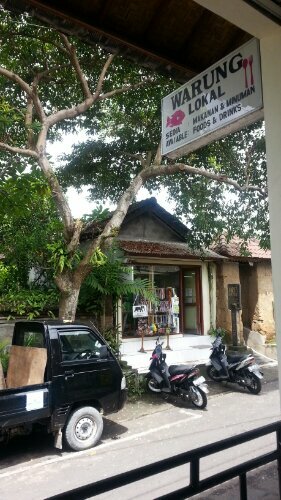 Sitting amidst the quaint shops at Jl Dewi Sita is no-frillsWarung Kacu. The lumpia, gado-gado, cap cay, and nasi goreng are delicious. 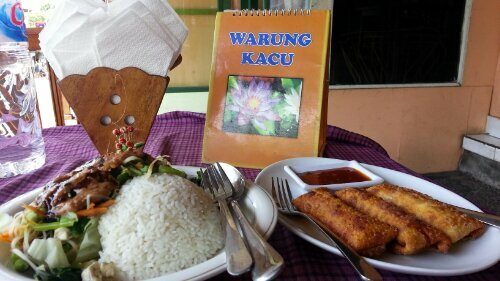 I’ve heard much about Fair Warung Bale so on my way to Warung Schnitzel, I detoured there instead. The place had a friendly atmosphere as the staff was all smiley. Unfortunately, that was what they were just mostly good at. Service was slow as they seemed to be more intetested chatting or hanging around the counter. I ordered a chicken curry and their 5-minute Heavenly Cake. I’ve already written about the cake that turned out to be a burnt pancake in a previous post. The curry was of a generous size and quite good. However, at IDR 50,000 it wasn’t good value as you could get the same quality at other less expensive places. I’m kinda ambivalent about this place. I’m not sure if I’m gonna like it or not. I kinda feel it’s just all hype. The owner, Alex, was a nice guy who greets customers and even clears the table as his staff is too busy chatting or trying to be cute. The nasi goreng urutan at Warung Biah Biah at Jl Gootama was such a let down after all those reviews at Trip Advisor. Urutan is Balinese pork sausage which is delicious. 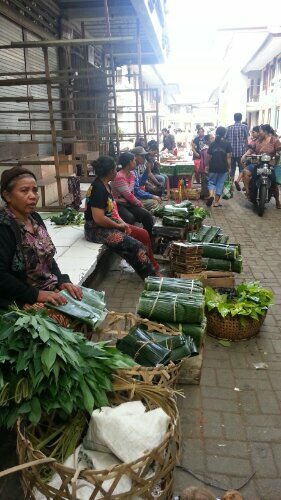 Having tried one at the Ubud Market in the morning. Mixed with nasi goreng you can’t go wrong. However, it tasted just like ordinary fried rice with a little sausage mixed in. The pork in sweet soy sauce was just as average. Both dishes just didn’t have any hint of spices. The place was packed for dinner and I was fortunate to grab a single table at the back. It took some time for my order to arrive maybe because of the large crowd. The prices are reasonable and you can order small plates (IDR 8,000) which were really small like the equivalent of two tablespoons to create your own nasi campur or add it to your existing spread like what I did with mine. Nothing really distinguishes a restaurant that calls itself a warung from one that calls itself something else such as a cafe or a restaurant. Everyone loves Cafe Wayan and who wouldn’t? The service is warm, the setting beautiful, and the food plentiful and delicious. The Sunday dinner offered a good sampling of Balinese and Indonesian favorites like nasi kuning, gado-gado, sate lilit, curry, and many more. Good value at IDR 150,000. The New Year’s Eve dinner was quite expensive at IDR 275,000++ but I enjoyed it. 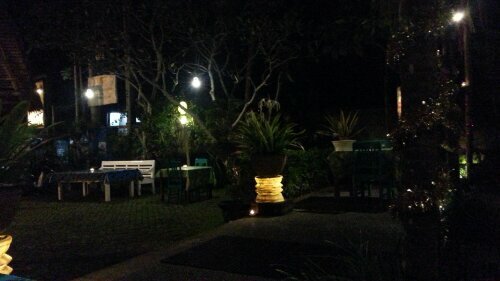 Considering that other restaurants were offering sit-down dinners for IDR 250,000 it was good value. The babi guling wasn’t very tasty though and the skin wasnt crunchy. Super delicious sate babi and seafood curry. The dinner came with a glass of complimentary wine. I’ve also ordered ala carte— gado-gado, and spring rolls. 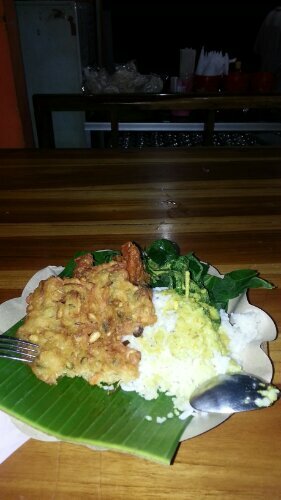 The nasi campur was very good value for money as it was very filling though I found the opor ayam quite bland. 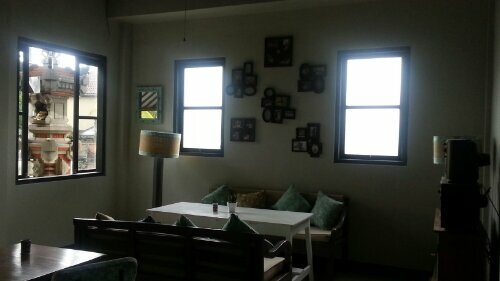 I really enjoy dining at Cafe Wayan because not only do they have beautiful surroundings, the staff really make you feel at home. Dapar Bunda. It seemed newly opened and had very nice interiors. The place was spacious and very clean. 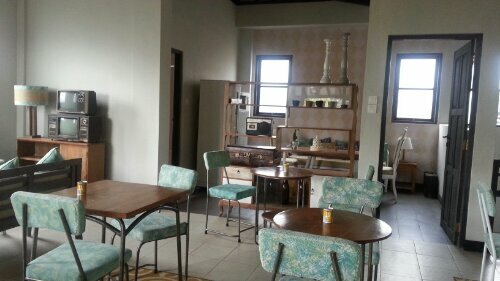 With retro furnishings such as old typewriters and television sets, it felt like being in someone’s house circa 1960s. 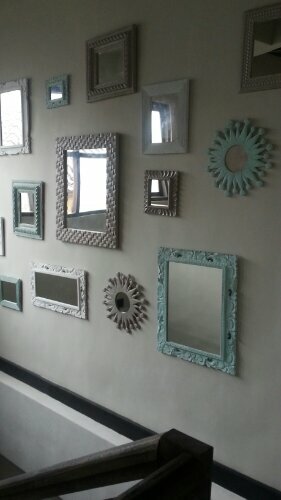 I loved this wall of mirrors. Alas, what would have been a nice morning enjoying the place was cut short when my food arrived. The concept was to create your own nasi campur. So I chose nasi kuning, jackfruit curry, and potato fritters. It amounted to less than IDR 20,000. Cheap. For such a huge cup of rice, the portions of the viands were so small. Jackfruit curry was only two spoonfulls and was so bland I had to put salt. The potato fritters were the size of a coin. I was so disappointed I finished my food quickly, got my stuff, paid, and left. Never to return. 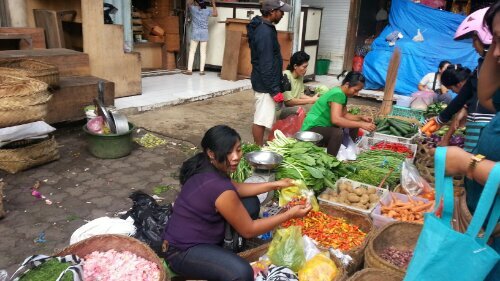 Any tourist to Ubud has two items on their culinary bucket list– babi guling at Ibu Oka and bebek bingil at Bebek Bingil. 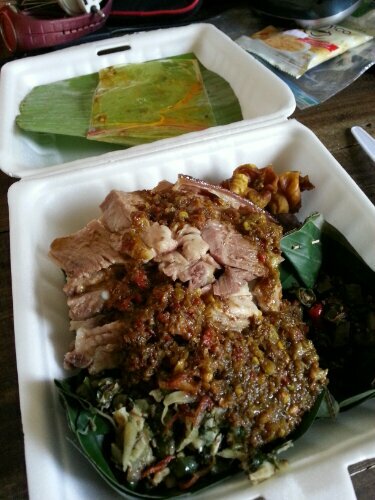 On my first visit to Ubud a couple of years ago, I enjoyed Ibu Oka’s babi guling so much I had it almost everyday. This time, I ordered a special for Christmas lunch and it was disappointing. Not very savory and the skin wasn’t crunchy. 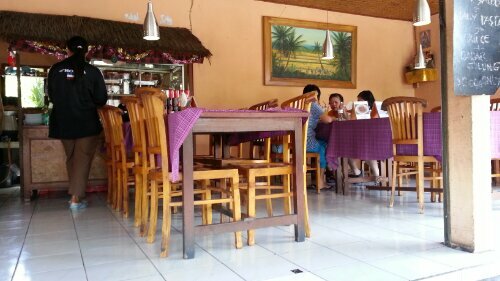 Three locals have already told me the taste of Ibu Oka isn’t very Balinese. 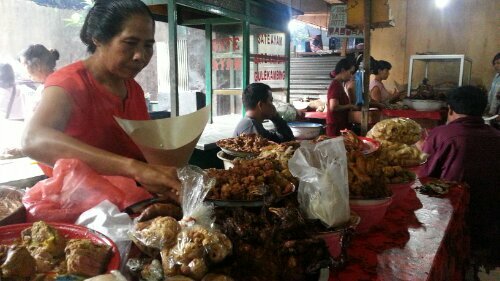 Bebek Bingil is to crispy duck what Ibu Oka is to babi guling. Ordered a set meal and came out satisfied. The bebek was crispy and tasty. I could have eaten two. 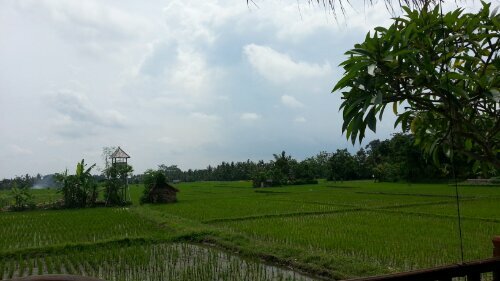 There’s nothing like Bali’s rice paddies, no matter if it’s just a few hectares, to bring people in and raise prices up. 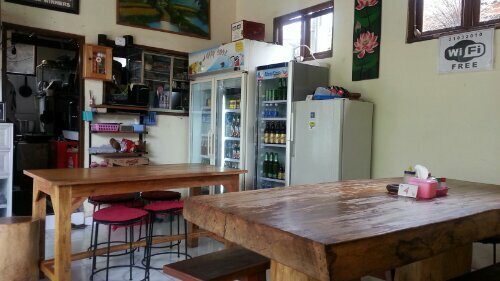 Often, it’s the only thing the warung, cafe, or restaurant has got going for itself. 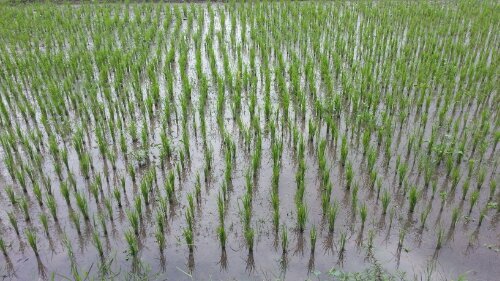 With tables placed literally alongside the rice paddies, I wonder how it look come planting or harvest season when people actually work the fields? 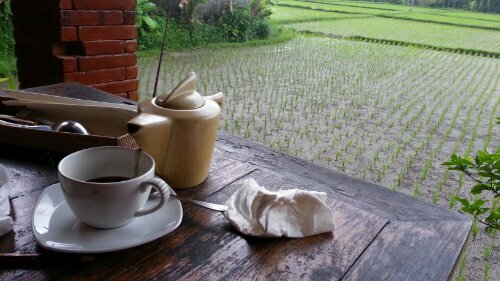 Cafe Angsa at Jl Hanoman has lovely wooden tables and chairs and a gorgeous view of rice paddies at the back. Your table is literally beside the paddies just like in Three Monkeys. Service and prices are equally friendly. The kari tahu (vegetable curry) was soupy but tasty. 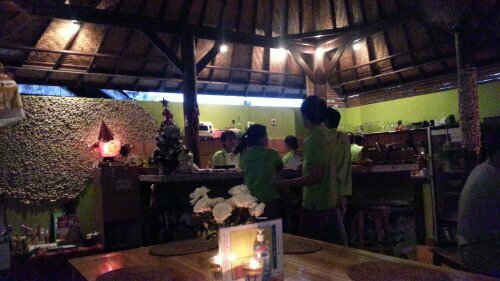 They also have one of the cheapest kopi bali around for only IDR 10,000 a pot. Located just beside the posh Three Monkeys, Roi Pasti is easy to miss with its small entrance. Once inside, you share the same paddies with its more expensive neighbor but you dine on more affordable food and simpler surroundings. But you came for the paddies and the free wifi, right? So choose cheap and enjoy them at Roi Pasti unless you have a deep pocket. 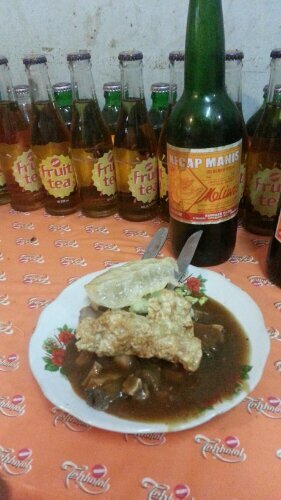 Had a tempe in kecap manis. Cheap, filling, healthy, and yummy. 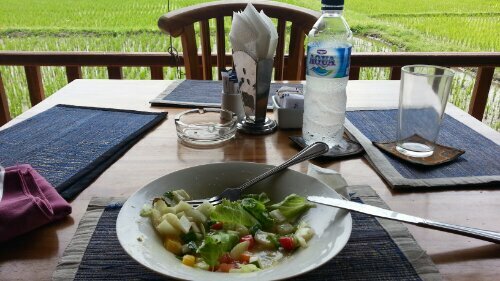 If you want bigger rice paddies, take the short flight of steps to Tropical View Restaurant where the Greek Salad tastes nothing like Greek Salad. Think cheap pseudo – mayonnaise with vinegar. Come here for the view. 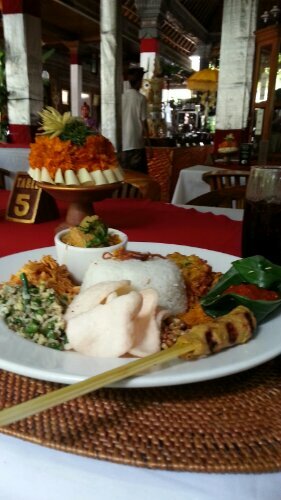 There is so much food to enjoy at Ubud. I hadn’t even tried others that come highly recommended such as Melting Wok for their curries and Warung Pulang Kelapa for their prok ribs. If you tire of local fare, Pizza Bagus and Scannapoli score points based on internet reviews. There’s even a taco joint!